ANNAPOLIS, Md. — Inside T.J. Oshie’s stall in the locker room the Navy Midshipmen call home, a photo of the USS Saint Paul battleship was propped up next to a puck. Nearly 700 players and coaches have now participated in at least one of the NHL’s 24 regular season outdoor games, but for Oshie, it was fitting that his first waited for the 2018 Stadium Series at the United States Naval Academy. Both of Oshie’s grandfathers served together on the heavily armed Saint Paul, the muscle for aircraft carriers - but didn’t make the connection after until his parents started dating. Everywhere you look at Navy-Marine Corps Memorial Stadium, it’s hard not to be captivated by the setting that will make this the most unique outdoor game yet. The rink itself is surrounded by a water backdrop on the field, made to look like it is part of an aircraft carrier. A green buoy sits just off one of the corners of the rink. Nearly 38,000 fans will fill seats individually dedicated to fallen sailors by classmates, friends and family members. The names of famous Navy battles dot the stands. Some 500 Midshipmen will make their way over from campus in this small seaside state capital to take in the game. Members of Navy’s club hockey team chatted with Maple Leafs coach Mike Babcock after practice on Friday. High winds prevented both the Maple Leafs and Capitals from holding morning skates on Saturday, but the puck will drop at 8 p.m. ET as schedule. Of course, there will be all of the pomp and circumstance - with a pre-game flyover from Naval aviators - to kick off the night. “That always gets you going,” Leafs forward James van Riemsdyk said. Maple Leafs defenceman and Minnesota native Jake Gardiner shared the story of how his grandfather, Del Jensen, nearly made the ultimate sacrifice in an accident onboard the USS Bennington in 1954. Gardiner’s grandfather overslept that day, but should have been in a portion of the ship where an explosion happened and killed 103 crewmen. 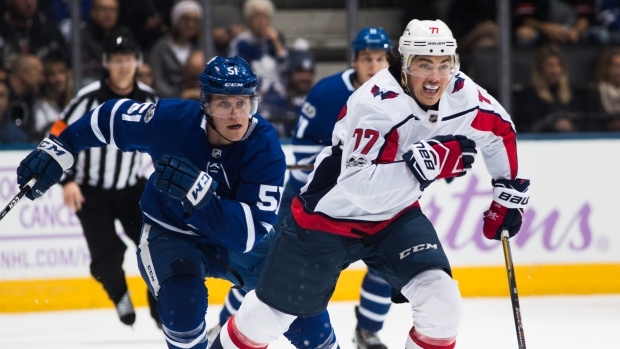 Oshie, Gardiner and van Riemsdyk are among the eight American-born players who will skate in Annapolis, while perhaps the most prominent, Auston Matthews, continues to rehab a shoulder injury back in Toronto. But even for the Canadian-born or non-North Americans, they say this game holds special meaning because of the scene. The NHL hopes hold other outdoor games at American military academies in future years. Oshie will be thinking of both of his grandparents on Saturday night, with that photo serving as a gentle reminder, while 15 family members flew in from the Seattle area for the game.